7 days to go! Are you ready? 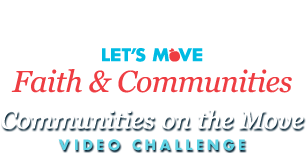 The submission deadline for the Communities on the Move Video Challenge is Friday, April 6 at 5 p.m. EDT. Winning videos will be featured on the Let's Move! website, and winners will have the opportunity to meet First Lady Michelle Obama at the White House later this year. Here's a handy checklist to help you wrap things up. Ask yourself whether you can answer "Yes" to each of these questions before hitting that submit button! Is your video between 1 and 3 minutes long? Do you have a transcript of all the words that are spoken/sung in your video? Did you obtain actual signatures for the Video Image Release and Video Copyright Release? Does your video describe how your organization has worked to improve the wellness of children in congregation(s) or communities? Does your video focus on at least one of these topics: healthy eating, physical activity, and/or access to healthy, affordable food? Does your video direct viewers to www.letsmove.gov for more information? Have you reviewed the Official Rules and the Enter an Application page to make sure your submission includes all the required items? Don't wait until the last minute to upload your video to YouTube or Vimeo! Keep in mind that the time it takes to upload/process a video varies greatly depending on the format of your original video, file size, upload traffic, Internet connection speed, and could take anywhere from a few minutes to several hours or more. We highly recommend that you budget enough time, so that you won't miss the deadline. Good luck. We can't wait to hear about the amazing work you're doing in your communities! If you have any questions about the competition, please email us at support@ChallengePost.com and include "Communities on the Move" in the subject line.